Honesty is the best policy, except when it's to yourself. Over the years I have come to notice that I am not always 100% honest with myself. Though it's rare, I sometimes get a little ambitious. I call it the "New Year's effect." I make plans to break my bad habits, or to start forming good ones, and I'll get incredibly committed, but only for like an hour, tops. Have you ever been in a gym on New Year's Day? Everyone and their mother is in there in hopes to stay committed to their New Year's resolution of working out. Well, slowly throughout the year, fewer and fewer people start to show. This is the process I go through at least once a week. So, here are, of what I consider, the most frequent lies that we tell ourselves. 1. "I'm going to start running more"
I usually just run from my responsibilities :). 2. "I'm going to start drinking more of that green smoothie sh*t"
I've already said that exact sentence three times today. 3. 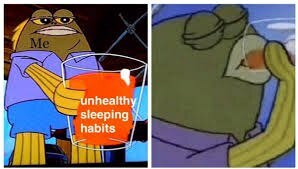 "I'm not going to stay up until 2 a.m. tonight"
Yeah, I've already had three glasses of "unhealthy sleeping habits" today. 4. "I'm going to read more and Netflix less"
5. "I'm going to drink SO much more water"
Water is SO crucial for survival and living a healthy life. Two drops a day should do. 6. "I'm going to be more organized and clean"
I'm Kevin. My life is the can of chilli. 7. "I'm going to be more social"
Me to any good person or thing that tries to become part of my life. 8. "I'm going to be crafty and make all the cute things that bloggers are always blogging about"
Every time I go on Pinterest I always end up getting convinced that I can make the cute crafts all the soccer moms are blogging about, but then I remember I'm the definition of Pinterest fails. 9. "OK, I'm not spending any more money on food this week"
10. "I'm going to travel as much as possible"
Me remembering I'm actually a broke college student, and the only traveling available to me is from school to work. 11. "I'm not going to wait until the night before to study for an exam"
Watching my GPA slip after I waited until the night before the exam to study. 12. "OK, I'm going to go into target and buy only what I NEED"
Walking out of Target, buying everything I havenever needed, ever.